Events with a roof - Venues across the UK and throughout Europe host events requiring professional audio on a regular basis: from Boxing matches to conferences and more let DD Pro Audio take care of it with confidence. Including pro audio hire and visual systems from ADJ, RCF, Chamsys, Bose,Martin Audio, K&F and D&B Audiotechnik + a large range of rider friendly digital mixing consoles, Projectors and more ready for all of your event sound and AV hire needs. 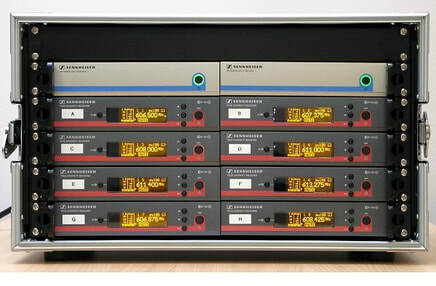 Wireless RF gear can be a complicated beast, but no need to worry: Our touring engineers are Sennheiser certified RF technicians and have years of experience. ​We offer a large range of wireless microphone and in ear monitor systems for hire just let us know what you need. One of the first regular events that we did the audio for when the company first began was for Boxing Matches in a large indoor arena - Through years of experience with sound hire for boxing events we have become somewhat specialised in providing crystal clear audio for these types of shows. We also supply photography and lighting packages for Boxing matches including smoke jets and silver entrance curtains with gantry. When clarity is key and large systems must be kept discreet we have you covered: Our systems are perfect for large infrastructure exhibitions, conferences and other speech critical events. Our professional audio hire is available alongside our Screens, Projectors, Tech and other equipment; to provide a complete package for your professional conference, seminar or exhibition event. ​ We are an official supplier of Waves Soundgrid and Auto mix systems: Waves legendary DSP and plugins have now been made available to integrate at zero latency with live sound mixing console - Now introducing the Dugan Automix system your conferences have never sounded better with intelligent voice weighted technology doing the heavy lifting. We are happy to install and design systems for concerts in unique locations such as warehouses, churches and more - No venue to large, small or strange! Have your events audio recorded: We can add a recording rig to your sound hire package without a problem as our systems integrate easily with all of our live mixing consoles available to hire. Go out with a bang: Partnered with British fireworks champions Blitz we are proud to be able to offer our events clients the very best in indoor pyro and fireworks effects for their shows.